138 pages | 15 B/W Illus. 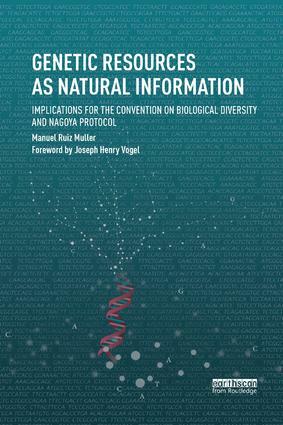 Demonstrating the shortcomings of current policy and legal approaches to access and benefit-sharing (ABS) in the Convention on Biological Diversity (CBD), this book recognizes that genetic resources are widely distributed across countries and that bilateral contracts undermine fairness and equity. The book offers a practical and feasible regulatory alternative to ensure the goal of fairness and equity is effectively and efficiently met. Through a legal analysis that also incorporates historic, economic and sociological perspectives, the book argues that genetic resources are not tangible resources but information. It shows that the existing preference for bilateralism and contracts reflects resistance on the part of many of the stakeholders involved in the CBD process to recognize them as such. ABS issues respond very well to the economics of information, yet as the author explains, these have been either sidelined or overlooked. At a time when the Nagoya Protocol on ABS has renewed interest in feasible policy options, the author provides a constructive and provocative critique. The institutional, policy and regulatory framework constitute "bounded openness" under which fairness and equity emerge. "With scientific capacity to sequence and manipulate genes increasing by the day, Ruiz's very timely book shows how current ABS concepts will soon be rendered obsolete and unworkable unless a way can be found to accommodate the reality that genetic resources are pure information, encoded in chemicals." – Pierre du Plessis, ABS expert, advisor and negotiator for the Government of Namibia. "The challenge of adapting the ABS legal regime to the realities on the ground is well addressed in this book through rethinking classical notions of genetic resources and sovereignty, and the promotion of the innovative concept of 'bounded openness' which would allow facing genetic research developments." – Alejandro Iza, Head of the IUCN Environmental Law Centre, Germany. "The implementation of access and benefit sharing under the international framework on genetic resources has been fraught with difficulties. Based on the economics of information, this book presents an alternative model intended to solve the conceptual and practical challenges so far faced. This is a refreshing contribution to a field where, despite the vast work done by academics, NGOs and governments, new ideas and approaches have been sparse." – Carlos Correa, Law Professor of the University of Buenos Aires and ABS expert, Argentina. "The authors operationalize my idea of 'bounded openness' for genetic resources as natural information. They show how radically different sectors of intellectual property can learn much from one another. The report from the frontline is that the future of knowledge management need not be the same as its past!" – Christopher May, Author of The Global Political Economy of Intellectual Property. "Manuel Ruiz’s powerful reminder to view genes as information underscores the need to further clarify the interface between intellectual property rules and fair, equitable and efficient access and benefit-sharing schemes. I strongly encourage intellectual property negotiators and policy-makers to read this thought-provoking book." – Wend Wendland, Director of the TK Division, WIPO. Foreword: "On the Silver Jubilee of ‘Intellectual Property and Information Markets: Preliminaries to a New Conservation Policy’"
1. The Relevant Nature of Genetic Resources: "Normal Science" Becomes "Paradigm Shift"
Case Study I: Epipedobates anthonyi under "Bounded Openness"
Case Study II: Lepidium meyeni under "Bounded Openness"
Manuel Ruiz Muller is Director of the Program of International Affairs and Biodiversity at the Peruvian Society for Environmental Law (SPDA), Lima, Peru. He is also Coordinator of the International Environmental Law course in the Environmental Law and Natural Resources Diploma at the Catholic University, Peru.